Everybody loves miniature treats. Take your favourite Christmas Cake recipe (Darina Allen’s Christmas Cake with Toasted Almond Paste is well tried, tested and true) and bake it in mini tins. You can use well-scrubbed baked bean tins – you’ll get approximately 12 out of a cake for a 10″ square tin – or simply cook it in a normal sized tin, then cut it into small cakes before icing. You can do something similar with plum puddings, using ramekins, or cups, that will withstand steaming. You don’t even have to ice these, just wrap in gingham and tie with matching ribbon. Homemade mincemeat always trumps the bought variety and you can add a new twist to this old favourite by adding some liqueur (try Cointreau or Amaretto) to your favourite recipe or by starting a new tradition with Willie Harcourt-Cooze’s Chocolatey Mince Pies. You could compliment a nicely decorated jar of mincemeat or batch of mince pies by delivering them with a mix for hot chocolate. Take some good quality chocolate buttons, add a few pinches of ground spices – cinnamon is classic but chilli is also fun – print out simple instructions (per person: heat a mug of milk, add 1-2 tablespoons of chocolate, simmer and drink) and package in a nice jar, topped with a layer of marshmallows. 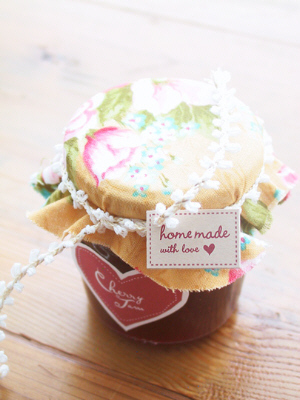 If you have any stashes of homemade jam, marmalade or chutney from seasonal gluts, pretty the jars up with some fabric and ribbon, then finish them off with beautifully designed labels and tags that can be downloaded from Eat Drink Chic. Spices are just the thing to prevent that post-Christmas slump and brighten up anyone’s January cooking. Dukkah, an Egyptian blend of toasted nuts and spices, will give a welcome lift when sprinkled across those virtuous New Year’s salads; ras al hanout adds a warming North African flavour to stews and couscous dishes; Indian garam masala is an ever useful ingredient to have on hand; and an American pie spice mix will add extra oomph to the next batch of apple tarts. Recipes are easily found online or check out Ian Hemphill’s The Spice and Herb Bible for these recipes and more. Keeping with the spice theme, take a pepper mill and fill it with a mixture of equal parts black peppercorns, pink peppercorns, allspice berries and coriander seeds. When cooking, use this in place of regular pepper. It is especially good over grilled meats or fish. 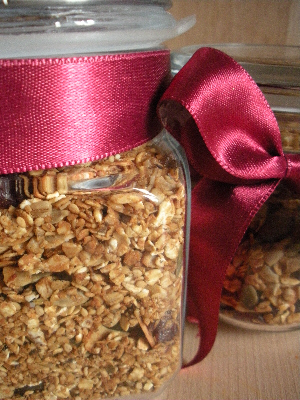 Granola is essentially baked muesli but a homemade version of this crisp, textured cereal is always a welcome gift. In a large bowl, combine 300g of rolled oats, 100g flaked almonds, 50g each sunflower, pumpkin and sesame seeds, 1 teaspoon ground cinnamon and a pinch of salt. Warm 3 tablespoons of honey and 60ml sunflower oil together, toss with the dry ingredients and bake on a large baking sheet at 150ºC for 35-40 minutes until golden brown. Allow to cool before mixing with 100g dried cranberries and packing into a large Kilner jar. Eat with milk, yoghurt – or directly from the jar.